Blackdiamond’s Metal Mayhem is back on Tuesday 16th April! As always the show will be on air from 6PM GMT for two hours on http://www.totalrock.com. This week’s show stars special guests, Swedish metallers WOLF, who I caught up with a few weeks ago on their UK tour. Tune in to find out all the latest updates from my chat with the whole band, plus of course plenty of their awesome music! Listeners on mobile devices can choose to listen via the TotalRock player, or the TuneIn Radio app can be downloaded. The show is also repeated from 9AM every Friday and 2AM Sunday mornings. Also coming up on the show – an epic assortment of the hottest metal tracks from bands such as GRAND MAGUS, ENFORCER, MEDJAY, DEATH ANGEL, POSSESSED, FLESHGOD APOCALYPSE, TROYEN and more! The META(L)SCOPE features selected tracks from the brand new album “Celestial Mechanics” by Apocalyptic Ambient Psych Doom Metallers TRONOS, don’t miss it! 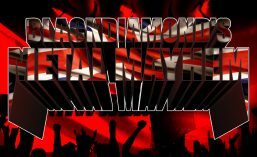 Blackdiamond’s Metal Mayhem on Tuesday 19th March was as always from 6PM GMT for two hours on http://www.totalrock.com. Listeners on mobile devices can choose to listen via the TotalRock player, or the TuneIn Radio app can be downloaded. The show is also repeated from 9AM every Friday, 2AM Sunday mornings and from 10PM Mondays. A significant part of the first half of the show was dedicated to guitar legend Bernie Tormé, who sadly passed away on Sunday 17th March. A great selection of tracks from Bernie‘s remarkable career were played in tribute to him. Also on the show, the latest singles from WARD XVI, DORO, ELUVEITIE, FLESHGOD APOCALYPSE, ONSLAUGHT, TROYEN, FALLUJAH, SPREADING THE DISEASE and SPOOKSHOW INC. plus more! Blackdiamond’s Metal Mayhem on Tuesday 19th March is as always from 6PM GMT for two hours on http://www.totalrock.com. A significant part of the first half of the show will be dedicated to guitar legend Bernie Tormé, who sadly passed away on Sunday 17th March. A great selection of tracks from Bernie‘s remarkable career will be played in tribute to him, may he Rest In Peace. Also coming up, the latest singles from WARD XVI, DORO, ELUVEITIE, FLESHGOD APOCALYPSE, ONSLAUGHT, TROYEN, FALLUJAH, SPREADING THE DISEASE and SPOOKSHOW INC. plus more! The META(L)SCOPE features Canadian thrashers UNTIMELY DEMISE with three tracks from their latest album “No Promise Of Tomorrow”. Blackdiamond’s Metal Mayhem on Tuesday 5th March was as always from 6PM GMT for two hours on http://www.totalrock.com. My special guest was Samy Elbanna, front man of Finnish thrashers LOST SOCIETY! Samy had lots to say about touring, their music and much more! Blackdiamond’s Metal Mayhem on Tuesday 5th March is as always from 6PM GMT for two hours on http://www.totalrock.com. Listeners on mobile devices can also listen via the TotalRock player, or the TuneIn Radio app can be downloaded. The show is also repeated from 9AM every Friday and 2AM Sunday mornings. My special guest this week is Samy Elbanna, front man of Finnish thrashers LOST SOCIETY! Samy had lots to say about touring, their music and much more, tune in from 6 to hear all the news and plenty of thrash! Also coming up the latest singles from CHILDREN OF BODOM, IN FLAMES and ANTHEM and the META(L)SCOPE features three tracks from OVERKILL‘s new album “The Wings Of War”! Blackdiamond’s Metal Mayhem on Tuesday 26th February was as always from 6PM GMT for two hours on http://www.totalrock.com. Listeners on mobile devices can also listen via the TotalRock player, or the TuneIn Radio appcan be downloaded. The show is also repeated from 9AM every Friday and 2AM Sunday mornings. This week’s show starred special guest, guitarist GLEN DROVER who joined me to discuss his new WALLS OF BLOOD project and the excellent new album “Imperium”, which was released via Metalville on 22nd February. A selection of tracks from the album were also featured. Also the latest singles from ENFORCER, EVIL CONSPIRACY, AVANTASIA, GRAND MAGUS and AENIMUS, plus more!